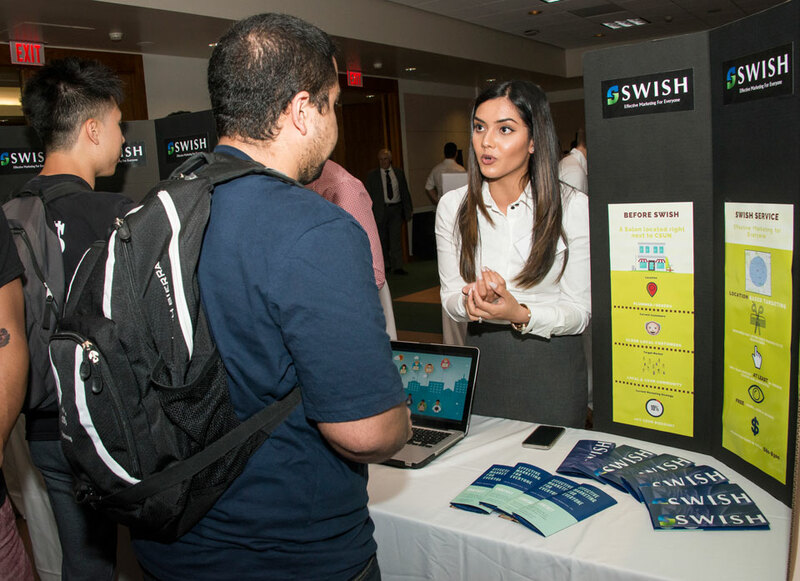 Student entrepreneurs in the David Nazarian College of Business and Economics will soon be using Alexa devices to power their ideas through CSUN’s participation in the inaugural Amazon Alexa Innovation Fellowship program. Photo by Lee Choo. Although we’re used to asking Amazon’s Alexa for everyday things like playing music or controlling home lighting, student entrepreneurs in the David Nazarian College of Business and Economics at California State University, Northridge will soon be using the devices to power their ideas through CSUN’s participation in the inaugural Amazon Alexa Innovation Fellowship program. The Alexa Innovation Fellowship aims to help support on-campus entrepreneurial programs through funding, Alexa devices, hardware kits and regular training.These resources are expected to be used for student scholarship and to further support innovation programs, operating costs and sponsorships. CSUN was recently named an Innovation and Economic Prosperity University by the Association of Public and Land-grant Universities and No. 2 in the greater LA region for producing tech talent by Bixel Exchange. Tim Tiemann, managing director of the CSUN Innovation Incubator, and Ryan Holbrook, Entrepreneurship Program director for the Nazarian College, were selected as fellows. The Nazarian College is the first business college to receive fellowships under the new program and joins other universities including Carnegie Mellon, Dartmouth and the University of Southern California. Plans for the initial year are to incorporate Alexa into a series of campus events, including a social entrepreneurship workshop focused on solving societal issues through voice technology and Alexa-enabled devices; to expand the I-Corps customer discovery program outside of that program’s STEM funding; to create student entrepreneur teams from diverse disciplines; and to expand the Fast Pitch, Bull Ring and CSUN Summer Accelerator programs to include more voice-activation technology startup teams. Amazon and CSUN already work together on campus: CSUN currently uses Alexa in business and information technology (IT) conference rooms and is exploring potential use cases for the technology in educational settings. In addition, many CSUN alumni call Amazon home, including alumnus Steven Rabuchin ’85 (Organizational Systems Management), a vice president for Amazon Alexa who oversees much of its work with third-party developers and device makers.